Bear Call Spread. An alternative name is Credit Call Spread. Bearish position. It is a vertical spread involving an equal number of long and short calls on the same underlying asset and with the same expiration date. It is a credit spread, which means you receive money to put on the position. The strategy profits as long as the price of the underlying security remains below the breakeven point. Sell to open one at-the-money (ATM) call and simultaneously buy to open one out-of-the money (OTM) call. The strike price of the short call is below that of the long call. The advantage of this spread is that it benefits from time decay and provides an immediate inflow of cash. The maximum gain and loss on the spread are very limited and well defined. Fig. 1, P&L Chart: The X axis is price and Y axis is profit/loss. The range of the Y axis is plus or minus the distance between the two strikes. The domain of the X axis is centered on the strike price of the short call. The net credit received when you put on the spread. The maximum loss occurs when the price of the underlying security hits or rises above the strike price of the long call. It is equal to the difference between the long and short strikes minus the net credit received. 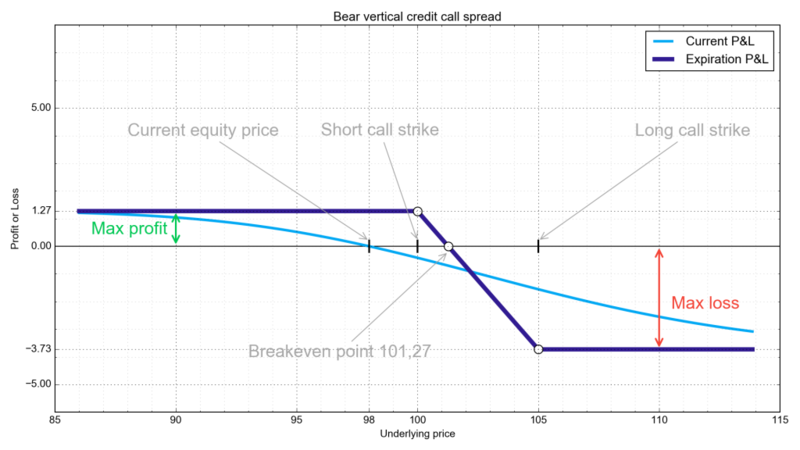 At expiration, the breakeven point is the strike price of the short call plus the net credit. On a profit/loss chart (see above) where the X axis is price and the Y axis is profit/loss, the value of the spread is a minimum at or above the long call’s strike price. The spread is composed of three connected line segments. The leftmost segment is horizontal from zero to the strike price of the short call. The middle segment is a negatively sloped diagonal line starting at the strike price of the short call and continuing until the strike price of the long call. The rightmost segment is a horizontal line beginning at the strike price of the long call and continuing to the right. The breakeven point is the X-intercept. You would put on a Bear Call Spread if you feel that the underlying asset’s price will remain stagnant or decline through expiration, and wanted to profit if your prediction is correct. The spread is more conservative than a naked short call, because the long call limits the maximum loss. However, the long call reduces the net credit received compared to simply shorting the call. An option’s probable price movement in relation to the price movement of the underlying stock. The value ranges from 0 to 1 for a long call and -1 to 0 for a short call where 0 means the option price is not affected by the stock price, and 1 means the option prices moves penny for penny in lockstep with the underlying’s price. Delta of whole spread thus ranges from a negative value to 0. While the overall spread is considered neutral, it is negative when the underlying price rises toward the short strike and reaches a minimum at the average strike price. As the underlying’s price continues to rise above the average strike, delta increases until it final returns to its maximum value of 0. In other words, the delta curve is symmetrical around the average strike price. Vega is the effect of the underlying stock’s volatility on the option’s price. For example, a vega of 0.3 means that an option’s price will rise by 30 cents for each point increase in the underlying stock’s implied volatility. For a Bear Call Spread, you want vega to drop after putting on the spread, because you’d like the price of the underlying asset to remain stable. 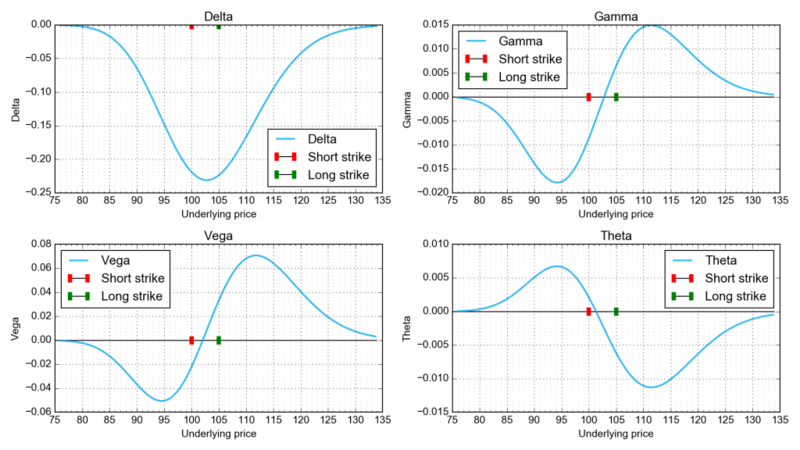 Vega is zero when the underlying’s price is well below the short strike, and becomes increasingly negative until the underlying’s price approaches the short strike price. Vega reverses and increases as the underlying’s price continues to rise, crossing the X axis (vega = 0) at the average strike and continuing to rise until hitting a maximum somewhat beyond the long call’s strike price. It then reverses direction again and approaches zero as the underlying’s price continues to rise. The time decay of an option’s price as the expiration date approaches. At the close of expiration day, an option’s theta is 0. Theta is lower for long expiration periods, which means the option loses time value more slowly than it would for short expiration periods. A longer expiration period increases the chance that the spread will expire in the money. Theta for a Bear Call Spread is positive (which means the short spread doesn’t lose value over time) until the underlying’s price rises to a point between the two strike prices. At that point, theta becomes negative, because there is less chance that underlying’s price will return to the short strike price. This is the rate of change of delta – the responsiveness of the position to the underlying’s price movement. In a Bear Call Spread, gamma is negative below the average strike price, which means delta will decrease in the direction of the stock move. Gamma is positive above the average strike, and a further upmove by the underlying asset increases delta. If the underlying moves far above the average strike, gamma re-approaches zero. Fig. 3, Time decay animation: Describing physics of the spread’s price as time expires. Fig. 4, Volatility dependency animation: Describing physics of the spread’s price when implied volatility rises or falls. Assume the share price of XYZ stock is $100.00. Sell to open one XYZ 100-strike call with 60 days until expiration and simultaneously buy to open one XYZ 105-strike call with the same expiration for a net credit of $1.27. Neglect commissions. $1.27. You receive $127, which is escrowed in your margin account. You are bearish on the underlying asset and would like the underlying’s price to remain stable or decline. Here are a few things to do if the underlying’s price moves. If the underlying security weakly moves above the short call’s strike price but you remain bearish, you could close out the spread and replace it with a long put or long straddle to take advantage of a drop in the underlying’s price. If the underlying security moves above the breakeven point and you are afraid it will continue to rise, you can convert the Bear Call Spread into a Short Call Ladder Spread by buying one or more OTM calls at increasingly higher strike prices. You could sell to close the long call and recoup a little of the premium. This would transform the position to a naked short call with unlimited risk. The Bear Call Spread has a negative risk/reward ratio, meaning you can lose more money than you can gain. If you are long-term bearish on the underlying asset and want a better risk/reward ratio, you could put on a Deep ITM Bear Call Spread, in which both the short and long calls are deeply in the money. Because the value of deep ITM options are due mostly to intrinsic rather than time value, a surprise upward move in the underlying’s price would have very little effect on the price difference between the short and long calls. Thus, upside risk is minimal. Conversely, the net credit on a Deep ITM Bear Call Spread should be close to the difference between the two strikes, since time value is relatively small. You can structure a Deep ITM Bear Call Spread such that the risk/reward ratio approaches 1:9. A Bear Call Spread limits your gains and losses in well-defined ways. The standard Bear Call Spread has an unattractive risk/reward ratio, but you can improve the ratio by using deep ITM calls. A further risk with a Bear Call Spread is that you are in danger of being assigned whenever the underlying’s price is above the short strike price. If you are assigned, you must deliver the underlying asset at the strike price, which will cut into your profit or cause you a loss. Even though you’ve covered the short call with a long call, you still must establish a long position for at least one day so that you can deliver it. If that occurs, the long call won’t help you unless the underlying’s price rises above the long strike, since the long call’s strike price is the maximum price you’ll have to pay for the underlying asset.